Upcoming Vaping Event 2019 and Vape Expo in Barcelona Spain. Vape Barcelona Expo 2019 will be the first vape convention we’ve hosted in Spain. Our company - VapeConventions.com - has hosted vape conventions in countries across the world with great success, and we want to go BIG for Vape Barcelona. Network with 1000’s of business owners, consumers and manufacturers in an area where vaping is extremely popular, and that has a huge demand for international premium products. For business owners, Vape Barcelona Expo in 2019 a great place to discover new products to sell in their store. For Vape Expo Exhibitors and sponsors, it is where you can network and do business with store owners, distributors and consumers in a new country. And for the general public, there will be an endless number of new eJuices, mods, and accessories to sample and purchase at Expo Vape Barcelona, Spain. Why Attend Expo Vape Barcelona 2019? 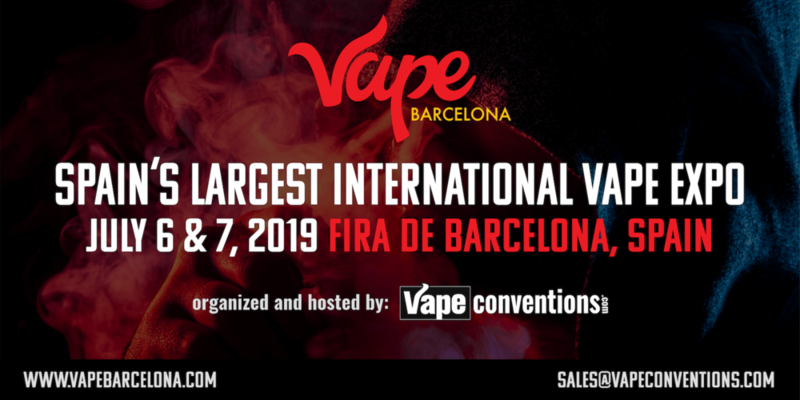 VapeConventions.com will be hosting Vape Barcelona Expo 2019 mainly due to Spain’s high demand for international eJuices, vape juices, vape mods, accessories, wholesale distributors and other services. Our goal is to connect vendors from countries around the world to shop owners, distributors and consumers in Spain at Vape Barcelona.